HONG KONG’S INTERNATIONAL FILM FESTIVAL EMBODIES ALL THE STRANGE CONTRADICTIONS UNDERLYING CHINA’S DIVIDED CONTEMPORARY CULTURE. ON THE ONE HAND THE CHINESE STATE HELPS PROP UP A FILM INDUSTRY BOOMING IN TERMS OF CINEMA NUMBERS AND BOX OFFICE SALES. ON THE OTHER HAND SOME OF THE NATION’S MOST TALENTED AND POPULAR FILMMAKERS SEE THEIR WORKS DELIBERATELY SHUNTED INTO QUIET SEASONS—JIANG WEN’S LET THE BULLETS FLY (2010) SPRINGS TO MIND, (P14)—TO LEAVE HOLIDAY SEASONS CLEAR FOR SAFER, VACUOUS HISTORICAL BLOCKBUSTERS OR OVERT PROPAGANDA LIKE FOUNDING OF A REPUBLIC (2009; RT94, P21). Other key contemporary directors like Wang Bing are barely known on the mainland, their films not permitted in cinemas or on television. Only in Hong Kong—a part of China, yet culturally quarantined from the mainland—can these films rub shoulders, providing some kind of rounded picture of what’s happening in Chinese cinema. No title at Hong Kong this year highlighted the divide between China’s official and unofficial sectors more starkly than Wang Bing’s The Ditch (2010). While many Chinese features since the 1980s have touched on the suffering inflicted by Mao’s endless mass political campaigns, few have been so brutally raw in their depiction of the Maoist era. Wang emerged from China’s independent documentary sector in 2003 with his nine-hour epic West of the Tracks, about the closure and decay of a massive socialist industrial complex in China’s northeast. His documentary roots are in evidence in The Ditch, an unembellished realist drama based on Wang’s interviews with survivors of Mao’s labour camps. 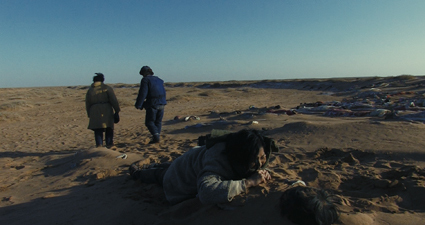 The film opens with the arrival of prisoners in a vast desert landscape, which appears empty until the men are assigned beds in caves dug into the desert floor. This is the Gobi in China’s northwest, where thousands were exiled after taking up Mao’s invitation to speak out about societal problems in the Hundred Flowers Campaign of 1957. The severity of their desert plight was compounded by the food shortages that swept China in the wake of the botched Great Leap Forward. Wang disturbingly evokes the desperation of men on the edge of starvation, consuming roots they know will poison them and finally resorting to eating the corpses of fellow inmates. This bleak tale plays out in long shots, the men only vaguely differentiated from each other as the indignities of prison camp life take their toll. They are dwarfed and ironically imprisoned by their wide open desert surrounds, adrift in a world utterly divorced from the urban environments they have come from. Wang shadows his characters in long tracking shots evoking the ghostly presence of the dead littering the landscape outside the caves. Every frame of this movie feels haunted—by hunger, death and the knowledge that the Chinese authorities have attempted to erase this history from the nation’s consciousness. Yu Guangyi’s documentary treads more familiar ground, presenting a subtle portrait of the pressures placed on rural areas by China’s city-centric mode of development. In the country’s far northeast a logging community ekes out an existence in a harsh landscape now largely bereft of timber. Most of the local women have left for the promise of a better life in the cities. We meet San Liangzi, a 46-year-old laid off worker, one of those left behind in this isolated community without money, a steady job or a wife. For a decade he has nursed a crush on Wang Weizi, a forthright woman more than 15 years his junior who runs a small inn, pursuing the tourist dollar with a single-minded determination. She also appears to be gay, a fact that does nothing to dampen her suitor’s obsession. During tourist seasons, he quietly tramps over to Wang’s inn every night, labouring without recompense as visiting urban tour groups indulge in hedonistic rituals of dancing and drinking around him. Yu’s film is resolutely non-judgmental and handles San’s gentle, lumbering personality with tenderness. At one level the documentary is a study of quiet personal obsession, but we are also left to ponder the personal and social distortions created by economic circumstances that have left the mountain stripped of trees, the local community without young women, and men like San stranded with virtually no hope of a steady income or family life in their hometowns. Jia Zhangke is one of the few filmmakers who has successfully straddled the divide between the commercial and independent industries in China in recent years, continuing to produce astute, innovative films since he began submitting his work for approval—and official mainland release—in 2004. His involving documentary, I Wish I Knew (2010; RT99, p17) appeared at HKIFF this year alongside the more recent project, Yulu. It’s perhaps unfair to describe Yulu as a “Jia Zhangke film,” since he produced the work, which actually comprises a dozen or so short documentaries by seven different directors profiling “up-and-coming figures who the younger generation can easily identify with,” to quote the festival program. Jia directs the opening and closing segments, both of which unfortunately exemplify the film’s problems. Jia’s opening portrait of Cao Fei, an entrepreneur who has created a groceries shopping website, is characterised by the lack of probing insight that runs throughout Yulu, reducing some of the episodes to the tone of a motivational video. The uncritical celebration of a “can-do attitude” becomes most problematic in the final segment—again directed by Jia Zhangke–on Pan Shiyi, Chairman of SOHO China, the developers who famously constructed a series of vast residential-commercial complexes around Beijing. Unsubtle attempts to ‘modernise’ the face of major Chinese cities have seen hundreds of thousands of people forcibly thrown out of their homes across the country, often with little or no compensation—a process that has greatly enriched developers and many government officials. Admittedly, SOHO’s complexes have largely been built on former industrial sites rather than residential zones, but like all such developments they have involved the commercialisation of land supposedly held by ‘the people’ under the socialist system, with the proceeds pocketed by officials. Jia’s uncritical celebration of a figure who has amassed immense wealth through this process is somewhat puzzling, given the attention his previous works have paid to China’s disenfranchised. Other segments offered more interesting subjects, such as Chen Tao’s profile of the blind folk singer Zhou Yu and the AIDS charity worker Zhang Ying. Wei Tie presented a moving snapshot of Zhao Zhang, founder of the environmental NGO Green Camel Bell, while the strongest segment was Tan Chui Mui’s profile of investigative journalist Wang Keqin. Most of the episodes, however, suffered from the same lack of depth that plagued Jia’s contributions. In the post-screening Q&A, an audience member pointedly asked if the film’s upbeat tone and theme of striding confidently forward were inspired by the walking figure of the Johnnie Walker logo. The liquor firm was the film’s principal sponsor. If none of the Chinese documentaries at HKIFF this year had the power of last year’s Petition (2009; RT97, p16), Wang Bing’s drama The Ditch demonstrates the independent sector’s ongoing interest in unearthing China’s buried stories—and the cinematic power of these hidden tales. Meanwhile Jia Zhangke’s Yulu did nothing to combat perceptions that political and market pressures often work hand in glove to dilute directors’ critical prowess. While most of the Chinese films at HKIFF in 2011 fell somewhere between these two poles, the selection illustrated that for all the liberalisation of China’s cultural sphere in recent decades, there remains a sharp divide between what can and can’t be shown in official mainland content, reinforcing the unfortunate truth that much of the population remains ‘shielded’ from the nation’s most incisive film products.